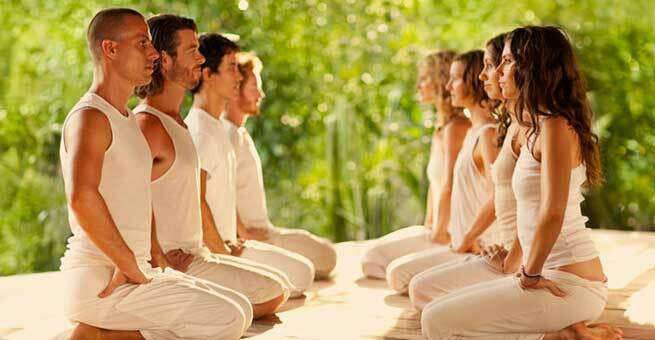 Sudarshan kriya is an ancient technique that has gained popularity of late due to the Art of Living foundation. It follows a breathing pattern that is rhythmic and helps in the all-round well-being of the body. Sudarshan means proper vision. The practice helps you gain a state of relaxation and harmony in the body. 1. Sit in vajrasana. Make sure that your posture is erect and close your eyes. This will cut you off from any external visual disturbance. 2. Hold your hands on the hips. 3. Now breathe in deeply, counting the duration of inhalation. You should be inhaling until you finish counting 4. Next, hold your breath for a count of 4. 4. Now slowly exhale, counting until you reach 6. Hold your breath for a count of 2. This is the first part of the kriya that is to be repeated 8 times. 5. Now rest the arms on the thighs, facing upwards. Take 5 normal breaths. 6. Second part- place your thumb in your armpits and your other fingertips touching each other, such that your palms are on your chest. Repeat the breathing technique of 4 in, 4 hold, 6 out and 2 hold. 7. Complete 5 normal breaths in between again. 8. Now raise your hands up, fold them back, such that your elbows are pointing upwards and your palms rest on your shoulders of slightly below. 9. Take 8 breaths of 4 in, 4 hold, 6 out and 2 hold. This completes the third part of the Sudarshan Kriya. 10. Now, take 5 normal breaths. 11. Next, for the fourth step called bhastrika, make a loose fist with both your hands. Raise your hands up fully while inhaling for 4 counts. Keep it raised for another 4 counts while you hold your breath. Now bring the fists down to rest them on the ribs when you exhale for 6 counts. Hold your breath for 2 counts. Repeat this procedure 20 times. Take 10 long breaths. Repeat the bhastrika another 20 times. Take another 10 regular breaths and then do another 20 counts bhastrika. 12. Now chant OM loudly 3 times. 13. The last part of Sudarshan kriya needs you to chant the mantra “SOHAM” rhythmically. 20 times of long chanting – sooooo… hummmmmm… , followed by 40 times of medium chanting and 40 times of fast chanting. This is extremely relaxing to the mind, with the vibrations of soham reaching all over your body. 14. Once you have completed this, you can lie down in shavasana. The whole procedure should last for about 30 to 40 minutes. It can be practised at any time of the day, except immediately after meals. It reduces stress. It calms the body and the mind. It improves your brain functioning. You sleep better when you practice the kriya. It equips you with more energy to go about your daily activities. With a calm mind, your interpersonal relationships become better. It reduces cholesterol in the body.